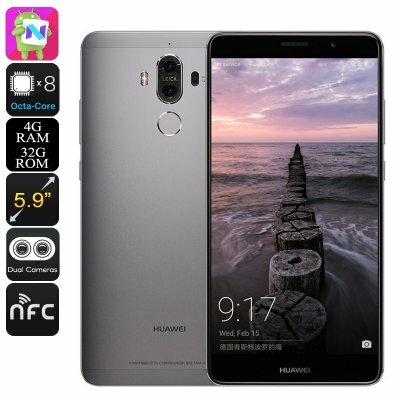 Successfully Added Huawei Mate 9 Android Smartphone - Leica Dual-Camera, 5.9-Inch Display, OTG, Android 7.0, Octa-Core CPU, 4GB RAM (Grey) to your Shopping Cart. Meet Huawei’s latest Android smartphone, the Mate 9. This magnificent device runs on the EMUI 5.0 operating system that has been based on Android 7.0. Besides coming with all the latest Android features, this OS furthermore packs an abundance of customization options – allowing you to adjust your smartphone experience to your exact personal liking. Packing the latest hardware along with an absolutely stunning Leica Dual-Lens camera’s, this Android phone is guaranteed to meet the likings of everybody out there. Packed within its sleek body lays a beautiful 5.9-Inch Full-HD display that portraits all media in breathtaking 1080p resolution. Supporting the latest IPS technology, this display is guaranteed to deliver vivid color along with high detail – ensuring an optimal mobile entertainment experience. Whether you’re into gaming, movies, or simply like to try the latest mobile applications – with this display at hand you can be guaranteed to undergo a great visual experience. Packing an epic 4000mAh battery, this Chinese smartphone delivers hours worth of continuous usage time. From now on you’ll be able to get through the most demanding of smartphone-filled days without needing to worry about battery life. What sets the Huawei Mate 9 really apart from its competition is its absolutely stunning 20MP Dual-Lens Leica camera that allows you to take your mobile photography to entirely new heights. No matter where you’re at, from now on you’ll be able to shoot great video and pictures – guaranteeing that never again a special moment in life passes by uncaptured. With 32GB of internal storage and the added possibility to throw in a 256GB SD card, you can be assured that this Android phone always holds enough space for you to save your pictures and video’s next to all your other files, media, and games. Packing an Octa-Core CPU that has been clocked at 2.4GHz along with 4GB RAM, the Huawei Mate 9 certainly is a powerful device that is capable of handling the latest mobile games, applications, and media without dropping a frame. Increasing your user experience even further is the phone’s OTG and NFC support. Additionally, it also features two IMEI numbers, allowing you to be connected to two phone numbers and 4G network providers simultaneously – magnificently increasing your overall connectivity. No matter where you’re at, with the Huawei Mate 9 at your side you’ll always stay connected.